It may be over a week away, but folks are already buzzing about the November 17th grand opening of the Arlington location of Chick-fil-A (2200 Crystal Drive). Not only for their so-bad-it’s-good, not open on Sundays, weird cow spokesman ways, but because they are welcoming themselves to town with a lot of free stuff. 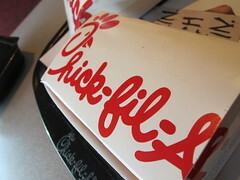 For the truly dedicated, the fast food chain will give out a year’s supply of free Chick-fil-A meals to the first 100 adults in line at 6am on November 17th. (No word on whether you’ll be able to sign up for a year’s supply of angioplasties too.) For those of you that are thinking, “pshaw, who is going to line up in the middle of the night for $260 worth of chicken?” look no further than Denver, where the city’s Chick-fil-A opening inspired 200 people to line up the DAY BEFORE the same promotion. The opening is actually Nov. 18 but folks can start lining up on Wednesday, Nov. 17 by 6am to be one of the first 100 in line to receive a year supply of Chick-fil-A being awarded at the Thursday, Nov. 18 opening. If they have more than 110 people by 6am on Wednesday, they will use a lottery system. Be prepared to camp out until Thursday morning’s opening if you are serious about receiving one of the year supplies… they’ll feed and entertain you during that time though.